Join us as we explore this missing piece of Jim Henson’s career in a celebration of his creative process. 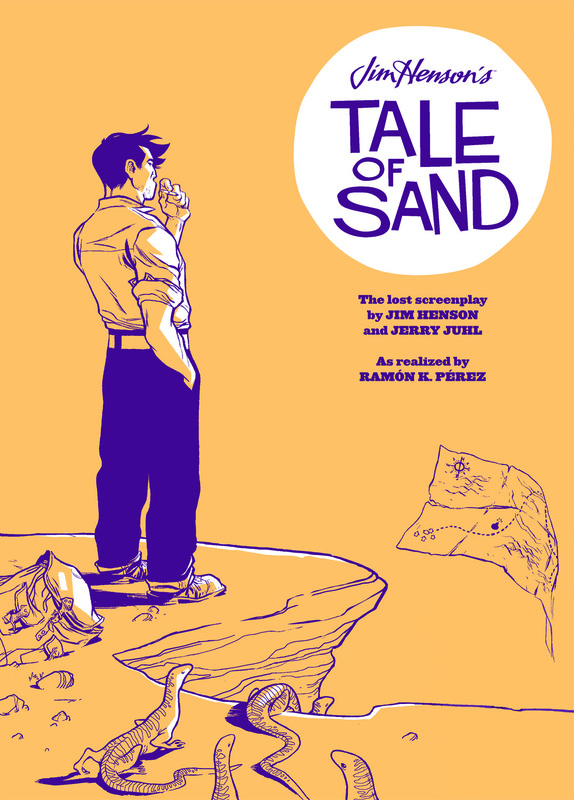 Discovered in the Archives of The Jim Henson Company, Tale of Sand is an original graphic novel adaptation of an unproduced, feature-length screenplay written by Jim Henson and his frequent writing partner, Jerry Juhl. Tale of Sand follows scruffy everyman Mac, who wakes up in an unfamiliar town, and is chased across the desert of the American Southwest by all manners of man and beast of unimaginable proportions. Produced with the complete blessing of Henson CEO Lisa Henson, Tale of Sand will allow Henson fans to recognize some of the inspirations and set pieces that appeared in later Henson Company productions. Now with Jim Henson's name attached it already had some buzz. And while some will claim Henson's name is the only reason it was viable and others will say it's good in it's own right, I'm in a kind of gray area. I can understand why it's an unproduced script and I can imagine if I tried to take this project somewhere with Ramon Perez on board it would probably fail too. But as something that's tangible and real, I really enjoyed it. It's certainly an artist's book and as an artist I have already rifled through it time and time again and don't see that stopping anytime soon. With a surreal story and minimal dialogue, Perez tell the story beautifully through his illustrations and varying styles ranging from ink and digital to watercolor, etc., etc. Henson's script has some fun things happening and it sort of mimics his 60's films in their experimental and surreal feel, which I think is told much better in a graphic novel format. I have a hard time imagining what it would be like as a film. At times it's quirky, at time's it's funny, at times it's actiony, and at a half hour read, it's hard to really say no to. This is a definite recommend to anyone. With it's time consumption of about a half hour, regardless if you get as much out of it as I did it will still be worth your time. Ramon Perez really kills it and while I said before it's an artist's book, Henson's story does have some fun stuff working in it. Rating: 4/5.